I like to draw. Often in the morning my son will come down to my office before breakfast and say, "What should we draw today?" And one of us will come up with an idea. Sometimes it's a silly alien creature or a spaceship, but often it'll be a real-life creature like a rhinoceros, or a cricket. Usually I draw without reference pictures. In fact, I don't generally look at any pictures first, which means I'm drawing entirely from my mental image of the subject. So I end up with camels whose legs are too short, kangaroos whose legs aren’t short enough, or elephants with trunks too fat and tusks too skinny. I have a mental picture of the animal, but it turns out that I haven’t been paying close enough attention, and my mental image isn’t detailed enough to let me do a reasonable drawing. Recently I drew a lizard, and when I was all done I looked at my picture and said, "There’s something seriously wrong with this lizard." I went to my computer and started looking up pictures of lizards, so I could identify what I’d done wrong. I'd made two significant mistakes. First, I'd drawn the lizard’s hind legs jointed in the wrong direction. That made it look ridiculously clumsy. The other issue was more subtle. When I drew the lizard’s head, I put both of the lizard’s eyes on the front of its head. In reality, a lizard’s eyes are on the side of its head. A lizard sees the world in a very different way than you do. 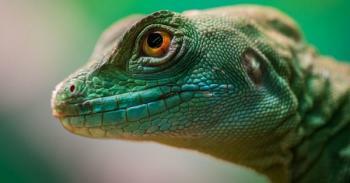 You have a narrower field of vision than a lizard, because both of your eyes are in front. A lizard can see a wider view -- more than 180 degrees. A lizard can see predators sneaking up while its back is turned! People joke that school teachers (and parents) have eyes in the back of their heads, but that's just wishful thinking. Sometimes I wish I could see that much all at once, but there would be a trade-off for that kind of vision: the lizard has no depth perception. Each of your eyes has its own field of vision, and those two fields of vision overlap. What does your brain do with that redundant information? It uses it (along with some subconscious trigonometry) to determine how far away an object is. But a lizard’s fields of vision don’t overlap, so it can’t do that. How does that affect the lizard? Well, imagine that Person X [use some person in the congregation] and I (who are about the same size) are on opposite sides of the lizard. He can see both of us. I’m standing 20 feet away, and Person X is standing 2 feet away. The lizard’s brain does not interpret this as someone far away and someone really close. He interprets it as one giant person and one tiny person, because he can’t tell how far away either one of us is. Change the scenario just a bit – imagine that there’s a mouse on one side of him, just a few inches away, and on the other side a lion which is 100 feet away. The lizard is going to mistakenly regard the mouse as a much bigger threat, perhaps even start to scuttle off in the direction of the lion. And he will discover, too late, that his vision fooled him, and he is nothing more than a tasty snack for the king of the beasts! So what does all this have to do with our scripture passage? Let's look again at the passage, and then we'll talk about it. What's the connection? Our scripture passage this morning is all about how we see things. Not how we physically see, but our mental and spiritual perceptions of the world around us. If we understand that Jesus is talking metaphorically here – and he must be speaking metaphorically, since our bodies are not physically “filled with light” – we recognize that not only is the eye a symbol for something, but so is the body. The eye is our view of reality – our perception, attention, and focus in this life of ours. The body is our life itself. In verse 22, the word you'll see describing your eye will vary depending on your translation. If you have a King James Bible, it will say "eye is single." In other versions you'll see words like "healthy" or "good." The word is a combination of both ideas. Single, in the sense of being simple and straightforward, like a single field of vision. Healthy, in the sense of being whole and performing its function. If you see life with a single field of vision, eyes forward, focusing on the goal ahead of you, then you see clearly and accurately, and the whole course of your life will be glorious (filled with light). But there is an opposite which can occur: instead of your eye being filled with the glory of Christ and his kingdom, it could be filled instead with everything that this world has to offer. What are the things you can get out of this life? Power? Money? Pleasure? Fame? Glory? Jesus says that if your pursuit of these things has caused you to take your eye off the prize, then they are nothing but darkness, and your whole life will be filled with darkness. No wonder in verses 19 and 20, Jesus contrasts the treasures of this life with the treasures of His kingdom. One is eternal, Jesus says, and the other is doomed to decay, rust, or be ripped out of your hands. Because I'm a physics teacher, I often think about things in terms of physical laws of the universe. What Jesus is talking about here is Newton’s second law of thermodynamics. Newton said that in this physical universe of ours, everything will fall apart. Jesus told everyone the second law of thermodynamics 16 centuries before Newton was born! Everything you gain, everything you hoard, everything you hunger for will eventually rot away to nothing. Fill your belly and you will hunger again. Fill your bank account and it will still be used up. And if it’s not used up, it will be stolen, or you will find it no longer satisfies you. Fill your life with pleasures, and instead of being satisfied, you will spend your life wishing for more. So instead of focusing on these things which cannot satisfy you, and cannot last forever, fix your eyes solely on Christ, and upon the glory of His kingdom and your place in it, both here and forever. This is the treasure worth fighting for, worth living for, and worth dying for. Why? Because Christ has – for all time – defeated Newton’s second law. At the cross and at the empty grave Christ offered to us an eternal future free of Newton’s second law of thermodynamics. Don’t store up treasures that are subject to this universe’s laws of physics – store up treasure that transcends this physical universe! This is why, in the previous sections of the Sermon on the Mount, Christ repeatedly contrasted the rewards of men and the rewards of God. Don't choose the tawdry reward of a human "pat on the back" when you could have God's eternal reward instead. When you pray, don't do it for the attention of man, or that's the only reward you'll get. When you give, don't do it for a pat on the back, or that's all the reward you'll get. When you fast, don't do it to be noticed, or that's all the reward you'll get. But Jesus tells us that if we do any of these things for good and godly reasons, we will have eternal reward. Last month in our Advent message we talked about the momentary suffering of this life and the eternal weight of glory to come in the next life. In these verses, Jesus takes that idea in a very different direction. Paul tells us that the worst this world can dish out can’t hold a candle to the glories that await us. Jesus declares that even the very best the world can offer doesn’t cut it. Yukon Cornelius can talk about silver and gold all he wants, but I have something better than all of that. But sadly, it’s so easy for us to let the desires and the treasures of this life grab our attention. How often our eyes are focused on the paltry trinkets that this life offers, without giving a thought to that glory that awaits those who faithfully serve God with this life. To return to our friend the lizard, imagine that to the lizard’s left there is a single cricket waiting to be eaten, while on his right there is – at a fair distance – a whole swarm of crickets. You know what that lizard will do, right? He’ll completely ignore the swarm of crickets because it’s so tiny, and go after the single cricket. And here’s the kicker – will he ever regret his decision? No, he never will, because he will never even know what he missed out on. He will go through his entire sad little life settling for second best, because he never even saw the best for what it was. Why fix your eyes on Jesus? Why make Him the center of your devotion and adoration? Why not focus on the pleasures and hungers of this life? Because if you do, your life will always be second best, or even third or fourth best. Honestly, it doesn’t matter what place it is, because you’re just settling for less. Like the lizard, you'll go through all of your life not even realizing that you’ve settled for something less than the best. Don't settle for the tiny meal when there is a spiritual feast waiting for you. Here's something we all need to understand: the treasures of this life are closer to us than the eternal treasures, so without spiritual focus and depth perception, they will always seem larger to us than their eternal counterparts. Do not buy into that lie; your eyes are deceiving you! In the midst of all this, I think it’s important to avoid the error of thinking, "spiritual world = good; physical world = bad." It’s tempting to think that if we ever focus our attention on the mundane activities of this world, we are automatically losing our focus on Christ. This is not the case. As I was sitting in my office working on writing this sermon, I heard my parents’ tractor running next door. “They’re putting firewood in the basement,” I thought, “so they can keep the wood furnace running while my dad is recovering from his surgery.” I walked away from my sermon preparation, put on my hat, boots, and work gloves, and headed next door to help stack firewood. You might be tempted to think that I traded the eternal value of study and sermon preparation for the temporal and fleeting value of earthly, material things. After all, the word of the Lord lasts forever, and the firewood I hauled will all be gone in a month. But neither activity is innately eternal, and a load of firewood can have more eternal value than a hundred sermons. If I stack firewood out of care and concern for my parents, and because of my love for them, and the love and obedience of Christ compels my actions, then I am indeed doing an eternal and everlasting work, even though some of that wood is going up the chimney as smoke right now, as I speak. And if I should prepare a sermon with the selfish intent of impressing you all with my knowledge and understanding, then it doesn’t matter how prepared I am, I have traded the eternal for the fleeting, the glorious for that which rots away. Never make the mistake of thinking that material things are automatically less important; I think that when we reach the throne room of heaven we will discover that some of the greatest eternal treasures belong to those who did their service while wearing work gloves. I want to tell you about one more interesting creature: the chameleon. We know of the chameleon because of his ability to change color. But there's something else very interesting about this creature. He has a very strange eye structure which provides him some unique capabilities. For starters, the chameleon has a full 360-degree field of vision. He can see predators even if they are sneaking up directly behind him! But the really interesting thing to me is this: if a chameleon sees something interesting to one side, he has an incomplete understanding of what he's looking at, just like any other lizard without depth perception. But this is what the chameleon does: he turns his head toward the object, and while he's doing that, both of his eyes swivel toward the front, giving him the same overlapping field of vision that humans have. In other words, the chameleon can give himself depth perception at will! Wouldn’t it be great if our spiritual eyes worked that way? We could keep one eye firmly planted on the desires and hungers of this world, and one eye on Christ – and then when it’s convenient, we could shift our vision to give our full attention one way or the other! But spiritual vision doesn’t work that way. We cannot divide attention at will, and then refocus at will. Divided attention will always keep us from seeing what we need to see. In the end, if we try to live like a chameleon, we will discover that it’s simply impossible for us to maintain that kind of divided focus; Jesus finished by saying, in essence, "You can’t split your devotion between this world and the next, because you will inevitably be drawn to focus on just one. A divided loyalty cannot last." Do you remember why I drew my lizard incorrectly? It was because I’d never focused on a lizard. I’d never fixed my eyes on a lizard and really looked at it, really studied it. Because I never did that, I didn’t have the understanding I needed to accurately replicate the creature. This is why the book of Hebrews tells us to “fix our eyes upon Jesus.” Not one eye on the world and one on Christ – both eyes in single, complete focus on the glory of Christ. If I keep my eyes divided instead of keeping them single and whole, fixed upon Christ and His kingdom, I will never have the wisdom and understanding I need for the beauty of the Savior to be replicated in my own life. You’re not a lizard. You’re not a chameleon. Don’t live life like one. There is no earthly treasure, no earthly hunger, no earthly desire that is worth more than the glory that awaits us. So stop looking at the treasures of this world out of one eye while looking at the treasures of heaven out of the other. The treasures of this life are closer, so they'll always look bigger to you -- but they are not. Billy Sprague wrote it this way: "...the soul remains unsettled And the world a wilderness / In a time when nothing's sacred And souls settle for less." "May no half-heartedness, no worldly fear, no hungers or desires turn us aside from following the light unflinchingly. And may the God of all light shine in us and through us, and may our eyes truly be single, and full of light."